Construction is well underway on a 207-metre skyscraper by Zaha Hadid Architects in Beijing, which will feature a huge twisting atrium that is expected to be the world's tallest. The tower is split into two halves by the subway and connected by a huge central atrium. As it rises, the atrium twists at 45 degrees to orientate the higher floors with the east-west axis of Lize Road – one of west Beijing's main streets. Once completed, the 190-metre-high void is expected to be world's highest – a title currently held by the Burj Al Arab hotel in Dubai. The glazing will be double insulated and as each glass each pane steps up it is angled to aid ventilation. The intention is to help maintain a comfortable indoor climate in Beijing's weather conditions, which ranges from extremes of warmth and cold. Construction of Leeza Soho is to reach its full height of 207 metres in September this year, with the tower's completion slated for late 2018. "China attracts the best talent from around the world," explained Soho China's chief executive Zhang Xin. "It's important to work with architects who understand what the next generation requires; connecting communities and traditions with new technologies and innovations to embrace the future." 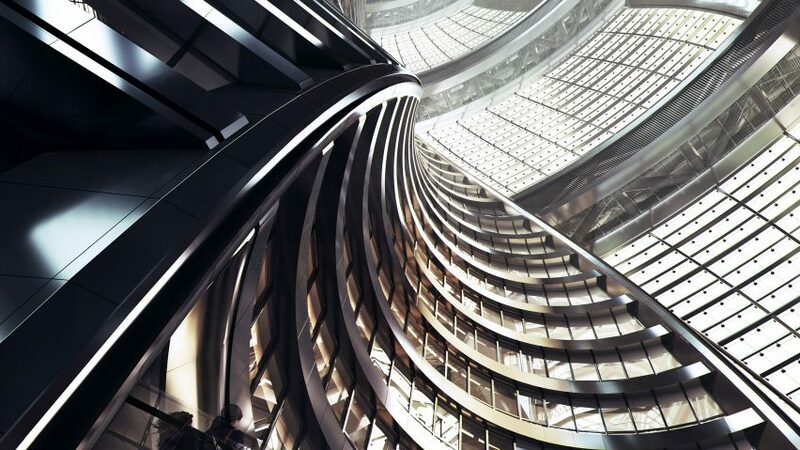 Zaha Hadid Architects aim to keep the building's energy consumption and emissions low by implementing systems based on real-time environmental conditions. Leeza Soho is one of over 30 projects under development by ZHA at the time of its founder Zaha Hadid's death earlier this year. Hadid's former partner Patrik Schumacher is now leading the studio, which has recently completed a new headquarters for Antwerp's Port Authority and is putting the finishing touches to a pair of skyscrapers in Nanjing.